Bottom Line Up Front: This is a 5.0 out of 5 stars album. As the various components aged in the past twenty years, the defining qualities of aroma, color and taste of the album have not only improved but done so dramatically. This album was most likely lost to both critics and consumers in a never ending field of pop punk and alternative rock during its initial release. But in today’s musical landscape, far removed from the mid-nineties, you can see the craftsmen responsible for the selection and fermentation process of the Angus soundtrack were true artisans. Movie Background: Angus is the story of the fat and socially awkward teenager, Angus Bethune, who is trying to come to grips with high school and family life. His sworn enemy is Rick Sanford aka the quarterback who seems to get everything in life handed to him including Angus’s dream girl, Melissa Lefevre. Angus is joined by his best friend, Troy through most of these trials and tribulations. But ultimately it’s up to Angus to decide if he wants to face the dangers and uncertainty that lie ahead at the high school winter dance or walk away from everything and transfer to a science oriented private school. The most noticeable aspects of the movie for me is it contains possibly one of the saddest scenes I’ve ever seen. The movie did get a DVD release finally so I’m not putting any spoilers here in case somebody wants to watch it. Overall, it’s a very enjoyable high school outcast movie. You’ve probably never heard of this movie because it came out around the same time as other movies focusing on overweight individuals that either earned more money or praise from critics. Personally, I think everybody was just too busy watching Se7en. It now has a strong cult following due to its more accurate portrayal of high school life and is worth checking out. 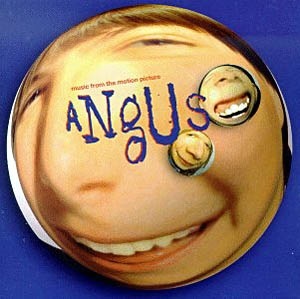 Album Background: The Angus soundtrack is a short collection of twelve songs mostly in the pop punk and alternative rock genres. It runs about 35 minutes. Like 50 First Dates, which I reviewed earlier, it is missing key tracks from the movie. This time it is Fade Into You by Mazzy Star and Rubella by the Smoking Popes. One surprising aspect of the soundtrack is that while it includes top notch original material from Green Day and Weezer, the first song Weezer submitted was rejected! The song was called Wanda (You’re My Only Love), which Rivers Cuomo later released as part of Alone – The Home Recordings of Rivers Cuomo. The song closely follows the short story from which the movie is based. It’s very pretty and worth listening to. I’m glad I bought the song while writing this review. I would have loved to hear a proper recording by Weezer though it’s highly unlikely that will ever happen. Favorite Track: My editor is the entire reason I watched the movie and listened to the soundtrack. Without her, there would be no Angus Bethune in my life. I didn’t even know about the movie until nearly a decade after it was released. Naturally, I consulted her when I had trouble deciding on a favorite track when there were so many strong contenders. My editor put it to me like this: “Yeah, you could go with one of those others. But when I listen to this album, I sit through all the other songs waiting for the last song to come on. It is the reason I listen to this soundtrack.” And she is right. The last song on the album, Am I Wrong by Love Spit Love, is the best track on the album. Love Spit Love was formed by Richard Butler when the The Psychedelic Furs went on hiatus in 1992. Their odd name comes from a performance art exhibit that was held in New York in 1991. But why does this song standout among the others? What makes it so special? The high school marching band, of course! The marching band was mixed into the original song for the soundtrack. Am I Wrong is featured in the beginning of the film where the marching band is playing their half-time show. The brass, woodwinds and percussion of the band make for a very unique sounding pop song. And they greatly add to the end of the song as the emotional intensity swells in a way that just wouldn’t be possible without the marching band. I consider this song a must listen due to how unique it is and how incredibly well it works, given the odd combination of the mashup that most people would presume to be incompatible. Ramones The Ramones, America’s most famous punk band, aren’t anywhere to be found on the soundtrack but yet they seem to be everywhere. Their influences are clearly heard throughout the album. This is especially with the tracks: Kung-Fu, Jack Names the Planets and Back to You. And that is most definitely a good thing. The choruses become incredibly catchy and a blast to sing along with as a result. Opening The album starts out with Green Day’s J.A.R. (Jason Andrew Relva) which is easily the most popular track on the album. This perfectly sets the mood for the rest of the album as you immediately feel compelled to pogo regardless of your surroundings. I particularly love the end where it get very quiet and the last word of the song is omitted. Not only is it a good start, it has a good ending. Fun Ash’s Kung-Fu is easily the most fun song on the album. Jackie Chan is prominently featured in the lyrics and the song was even used at the end of one of his movies, Rumble in the Bronx. Tim Wheeler wrote the song in five minutes and the band recorded it in one take using The Verve’s equipment who happened to be nearby at the time. That’s amazing to me and a testament to Wheeler’s ability as a writer and musician. Women Several female vocalists are featured on Angus. This includes female vocalists in the bands Dance Hall Crashers, The Muffs and Tilt. To have 25% of the songs on this album include lead female vocalists is pretty awesome given the genres covered are typically heavily dominated by males. It’s nice to see the women get some well deserved recognition. All of the songs with female vocals are excellent. Organization Elliot Cahn and Jeff Saltzman were in charge of this album and they did an amazing job. I would love to shake their hands if I could. The selection of songs and the order in which they were placed is absolutely perfect. I completely agree with the decisions to not include some songs. It would have ruined the perfection that they created when they made the ultimate musical time capsule for 1995. The songs complement each other well and the transition between tempos, genres and even topics is well executed A great example is Pansy Division’s Deep Water, which is about the struggles of growing up an insecure gay teenager. It is the perfect song to use to transition to the Am I Wrong to end the album. Nothing Like so many other 5 star reviews, I couldn’t find a single flaw in this entire album after listening to it for multiple weeks. In Conclusion: This might be my all-time favorite soundtrack. If not all-time, it is definitely my favorite of what I’ve reviewed so far. If you are looking for an album that is an absolute blast to listen to and doesn’t seem to ever get old, you really can’t go wrong with the Angus soundtrack. On Januray 7th 2011, Puella Magi Madoka Magica aired in Japan. The story of a young girl, Madoka Kaname, who was completely average in every way changed the world of anime forever for me after I watched it with my editor over the course of a week. With this series I went from a casual appreciation to being in absolute awe of what the art form was capable of and became a true fan of anime. I’ve begged and pleaded for many of you to watch the series, but for now I would like to focus on one part of the series: the music. Specifically, I’m reviewing the Puella Magi Madoka Magica Music Collection this week. Worth Your Time? Absolutely. In the 45 tracks, there’s a surprising amount of variation that creates a very balanced 2 disc collection. Twitter Review: PMMM MC is a wonderful collection of classical music with gorgeous solos and duets spiced up with some modern twists and fantastic pop songs. If you have not seen the series, DO NOT READ COMMENTS ON YOUTUBE as they are filled with numerous SPOILERS! Actually, close your eyes so you don’t see the artwork either. The less you know, the better your experience will be when you watch it. You will watch it, yes? Musical Motifs. The six main characters in the story each have their own music that is associated with them. Madoka’s theme Sagitta luminis isn’t heard until the end of the series but is one of the most powerful pieces throughout the whole 12 episodes. The gorgeous string composition moves many to tears. Mami’s theme Credens justitiam is also very powerful but I think in a more positive manner. I love the vocals for that track which I believe are from a made up language created by Kajiura; though they sound very close to Latin. Next, there is Sayaka’s themes Conturbatio and Decretum. They are both very somber songs using the same melody with Decretum being more aggressive as it appears later in the series. 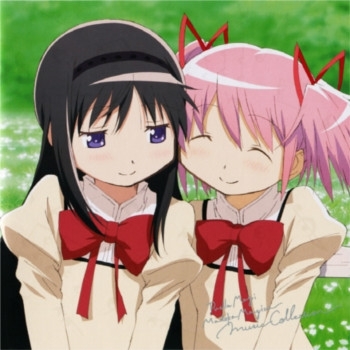 Homura’s theme appears 8 times in the series. Her theme Puella in somnio is a mysterious and melancholy melody simply repeated over and over with slight variations. It’s short but effective. The remaining girl, Kyoko, has a theme entitled Anima mala which is the most modern of all of them with a heavy hostile bass line accompanying the cello melody. Finally, there is Kyubey’s theme Sis puella magica which relies heavily on vocals and contains a beautiful flute solo. I especially love the rhythmic groupings of the vocals in this song. Solos and Duets. Throughout the album are numerous tracks of solos and duets that I think do a great job keeping the music fresh for the two hour runtime. Right in the beginning, Scaena felix starts things off with a nice acoustic guitar/piano duet. Desiderium is a piano solo that is playful with an underlying sense of worry like a small child playing in the park by themselves. Inevitabilis is another piano solo that creates a sense of uneasiness with sparse notes making up most of the track. Kajiura brings in some duet heavy hitters to the soundtrack with Rachmaninoff’s Volcalise Op. 34 no. 14, Bach’s Ave Maria and Debussy’s La Fille aux Cheveux de Lin due to the character Kyousuke being a violin prodigy. And, of course, I enjoyed all three of them every time I heard them. Serena ira is another somber solo track featuring a haunting and lonely cello. High Energy Tracks. While I enjoy the solo/duet tracks immensely, that is not all the soundtrack has to offer. As the series becomes more intense, the music ramps up right along with it creating some very memorable tracks. It starts with Terror adhaerens slowly building up to a powerful melody delivered by the strings section. This continues with Symposium magarum. This song actually made me feel like I wanted to be an orchestra conductor as I motioned my pen like a baton while taking notes. It’s such a great song. The album then switches to rock guitar infused classical piece with Numquam vincar. The progression between them works very well considering that all three tracks follow one after another on the album. After taking a short break with Quamobrem?, it goes right back into waging a full-scale war with the militant drums beats, bellicose vocals and the forceful string sections of Surgam identidem and Nux walpurgis. Both songs also have parts that lower the intensity considerably which creates a significant amount of tension in the songs as you wonder if the war has been lost despite best efforts put forth. The last energy-infused song is the last song on the album which is a live version of Numquam vincar which opens with an elegant piano solo followed by a more intense rendition of the original song featuring more expressive guitars accompanying the string melody. Themes. There is one opening theme used throughout the series by ClariS who formed while in high school. They were still in high school actually when Connect went Gold in Japan. It’s extremely well done j-pop with the perfect amount of emotional intensity in the vocals as the song unfolds. This theme song is actually repeated in an arcade scene in the form of a DDR remix which I thought was clever. The original closing theme is Mata Ashita which is translated to See You Tomorrow and is sung by the voice actress for Madoka, Aoi Yuki and is written by hanawaya. The second ending, And I’m Home, is used once for the end of a single episode. It was composed by wowaka, a notable figure in the Vocaloid community. Like See You Tomorrow, it was also sung by voice actresses from the series being Sayaka’s voice, Eri Kitamrua and Kyoko’s voice, Ai Nonaka. The main closing theme is by Kalafina and is called Magia. I really like the vocal processing in this song and the mixing of classical and rock instruments. Low Points: The low point of the album is the tracks that contain little to no melody and is mostly used to create atmosphere. But even they are a valuable asset to the 2 hour play time because it breaks up the rest of the tracks giving your ears some time to rest. Umbra nigra is a perfect example of this. It’s a track I would never listen to by itself but it works with in the context of the entire experience. There are quite a few more like this but I think this review already has enough links. Anything Else: I teared up multiple times while writing this review. The music is so deeply intertwined with the emotional impact of the series. It’s difficult for me to sit down and really listen to these songs without becoming emotionally overwhelmed. If the fact that I couldn’t write this review without any tears doesn’t convince you that you need to watch the series, I really don’t know what else to say. I am also very surprised how much staying power this album has had with me. Because of the variation of songs and length, I’m still not even close to be being tired of hearing it. I could easily do another week. I honestly could write at least another 1,000 words on the music but I’m restraining myself as much as humanly possible from creating any spoilers. The way they tie the music back to the plot is simply astounding and I will leave it at that. This week I’m reviewing the Super Fly soundtrack which was picked out by a co-worker for the first Readers Pick Review. Super Fly soundtrack has the distinction of making more money than the film. Worth Your Time? So good it doesn’t matter if you’ve seen the movie or not. Twitter Review: It’s not only a great movie soundtrack, it’s a great soundtrack for life. Headphones and Super Fly will have you walking around feeling 20% cooler. Composition. Curtis Mayfield wrote an absolutely gorgeous funk filled soundtrack. The way instruments play off each other and work together throughout the 9 tracks is phenomenal. The way Little Child Runnin’ Wild crescendos into pounding orchestra hits that transitions to strings and a minimalist bassline and finally ends with just the strings as they fade out is just so beautiful. There’s another part that I love in Junkie Chase where the bright horn sections plays off of the piano chords. It helps to create the sense of urgency felt throughout the track. Think, which I picked as my second favorite track, is an instrumental that easily won me over with its bewitching laid back arrangement. Johnny Pate was the orchestra/arranger for this soundtrack and deserves to be recognized for his work on the album carrying out Mayfield’s directions. Henry Gibson. The percussion in Pusherman is just awesome. It is the grease in the machine that enhances the performance of all of the other instruments. Henry Gibson played the rototoms on the track and did an amazing job but that shouldn’t be a surprise since Mr. Gibson has appeared on about 1200 albums. Saxamaphooooone. Curtis Mayfield played many instruments including saxaphone so it might be him playing tenor sax but I can’t really find any reference to who played sax throughout the album. Regardless, the saxophone sprinkled throughout several tracks is incredibly well done as it takes lead during the song or plays off of the other instruments. I loved every moment. Why Curtis, of course. Mayfield’s silky smooth falsetto delivery is definitely one of if not the highlight of the soundtrack. If anybody else sang these songs, I don’t think it would be so highly regarded. His singing in No Thing on Me (Cocaine Song) delivers a sense of optimism and tragedy juxtaposed on top of each other. Low Points: This is such an incredible album. Complaining about this album is like trying to take issue with Leonardo’s Mona Lisa. 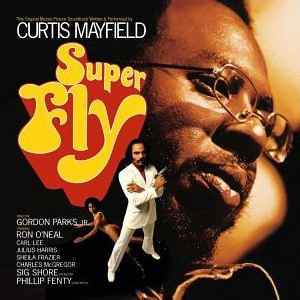 If there’s anything to take issue with the album is that the movie Super Fly comes nowhere close to the level of excellence that the soundtrack achieved. Not that I thought the movie was bad or anything, but they just aren’t on the same level. The music is just so good it seems out of place. Anything Else: After listening to this album for the first time, it brought an idea into my head. And that is the evolution of the drug dealer song. I don’t know if Pusherman is the grand-daddy of all drug dealer songs but I like to think it was an inspiration for later music such as Master P’s Mr. Ice Cream Man and Bone Thugs N Harmony’s 1st of da Month. Superfly 1990 by Ice-T featuring Curtis Mayfield and can’t nobody make a song (or TV show) awesome like Ice-T.
Not everything about 1990 is awesome though. In 1990, an accident at a concert caused Curtis Mayfield to spend the last 10 years of his life paralyzed from the neck down until he died from complications due to diabetes. During this time he was able to still put out music. He recorded the vocals for his last album, New World Order, line by line as he only had enough breath to do one line at a time from his bed. Reading this made me really sad. It didn’t seem fair that a man who created such beautiful music for the world and inspired an entire generation during the civil rights movement would end up getting screwed over so badly by life.